Fertile, well-drained soil with plenty of compost added. Tomato, Apple, Apricot, Plum, Cherry, Pear, Peach, Raspberry, Red Currant and Gooseberry. In fall, plant individual cloves 4 inches deep with the pointed ends up. Cover the planting with at least 3 inches of mulch. Use hardy Rocambole types in cold climates. Where winters are mild, grow heavy-yielding artichoke types. Among the most deer-resistant of all edibles. Dig up bulbs in summer when one third of the leaves become dry and lose their green color. 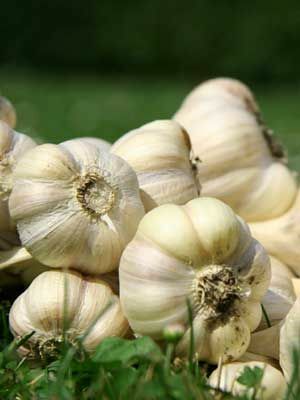 Shake off soil, and cure whole plants dry in a warm, shady place for two weeks before trimming and storing the garlic bulbs. Watch for winter weeds. Plants left in the ground too long often have loose bulbs that do not store well.